Please turn your attention to Ruvell Martin's crotch. This is just wrong. If any of you have any information that could lead us to the apprehension and conviction of the owner of the mystery right hand, please leave it in the Comments section so we can forward it to the Green Bay police and the FBUH (Federal Bureau of Unwanted Handjobs). Ben Stiller's quote when he zipped his frank and beans up in his zipper comes to mind. OOOOWWWWWWWWW! 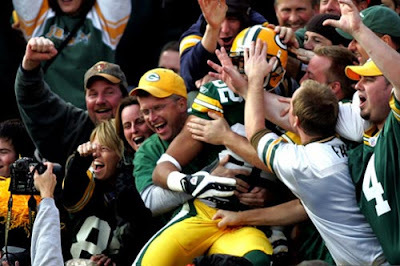 The Brett Favre fan that is squishing dudes nads is playing it off like a champ. http://www.ebaumsworld.com/video/watch/29303 Maybe he play's for the Cubs?